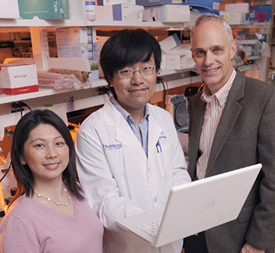 UT Southwestern researchers (from left) Drs. Yihong Wan, Wei Wei and David Mangelsdorf have found in mice that a hormone used as an anti-obesity drug causes significant bone loss. The hormone, fibroblast growth factor 21 (FGF21), promotes bone loss by enhancing the activity of a protein that stimulates fat cells but inhibits bone cells, researchers report in a study available online in Proceedings of the National Academy of Sciences. UT Southwestern scientists had been investigating this hormone’s properties since its discovery in 2005 as a potential drug. Bone loss was a side effect of another class of compounds that had been commonly used in the treatment of diabetes – activating the same protein in a manner similar to FGF21 – and leading the research team to investigate the bone effect of FGF21 in three kinds of mice. They found that rodents fed a drug form of the hormone over a two-week period lost 78 percent of their spongy bone. Mice engineered to produce excess FGF21 had similar effects. Conversely, researchers found mice completely lacking the hormone had comparable gains in bone mass. While the insulin-sensitizing effects of FGF21 make it a potentially powerful anti-obesity drug, that could be canceled out by risk of osteoporosis and fractures associated with bone loss, the investigators report. In a related study online in Cell, researchers at the medical center identified how FGF21 regulates the activity of a diabetes-fighting compound in fat tissue, altering metabolism in response to starvation and resumed eating for survival-driven energy conservation. “FGF21 helps mobilize the fat in adipose tissue back to the liver and burn it. But when the animal is refed, it stops this process and immediately turns back to restoring fat. In one case, it turns this system on, and in the other, turns it off,” said Dr. Steven Kliewer, professor of molecular biology and pharmacology and senior author of the Cell paper. UT Southwestern researchers involved in the PNAS study were Dr. Wei Wei, lead author and postdoctoral researcher in pharmacology; Dr. Paul Dutchak, postdoctoral researcher in neuroscience; Drs. Xunde Wang and Xushan Ding, postdoctoral researchers in pharmacology; Dr. Xueqian Wang, research associate in pharmacology; Angie Bookout, graduate student in internal medicine; Dr. Robert Gerard, associate professor of internal medicine; and Dr. Kliewer. The scientists in the Cell study included Dr. Dutchak, lead author involved while a graduate student in pharmacology; Takeshi Katafuchi, instructor in pharmacology; Ms. Bookout; and Dr. Mangelsdorf. Support for the studies came from the Cancer Prevention and Research Institute of Texas, March of Dimes, Robert A. Welch Foundation, National Institutes of Health and the HHMI.